There are 8 directions above: as the yellow and green arrows show. 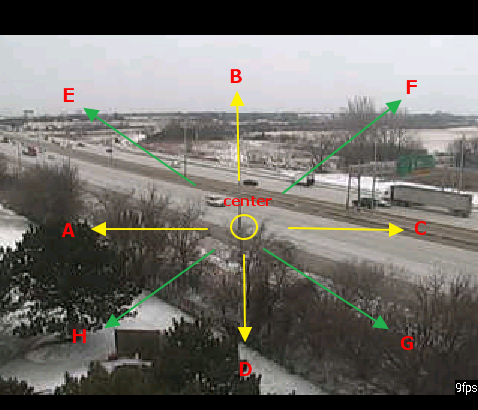 Most PTZ cameras support at least 4 directions and some of them support 8. So for PTZ cameras, this version provides tap to move on 4 or 8 directions depending what camera you are using. If you want the camera moves left, tap on any area near spot A; if you want up, go for B, and so on. In such way, you no longer need to swipe around on the screen but a single tap is good enough to drive your camera moving. Furthermore, this will work on multi-view screen as well - each camera image become your virtual joystick!